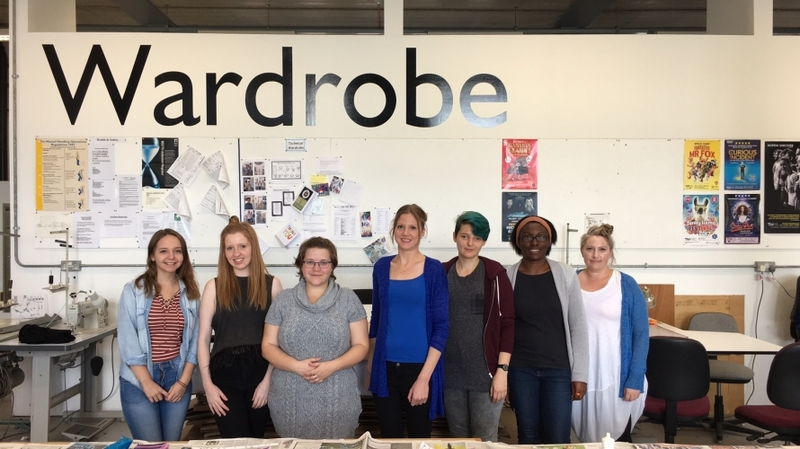 Today along with my fellow summer season bloggers, I had the privilege of experiencing the hidden gem of the Theatre Royal Plymouth’s costume department at TR2, shedding light on the world behind the wardrobe. 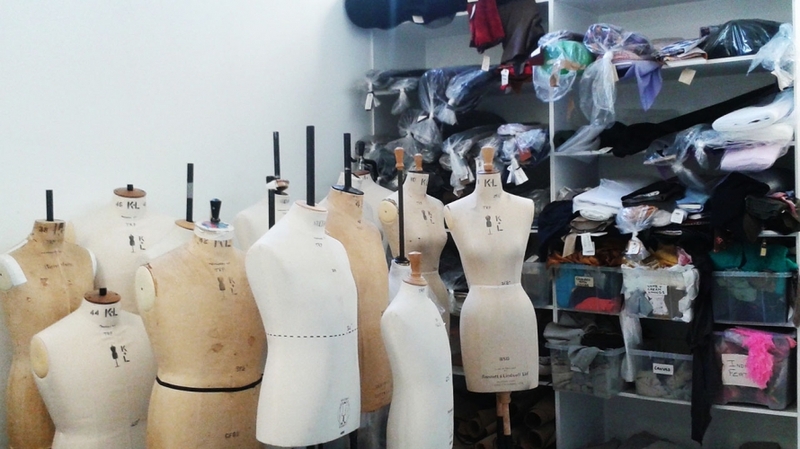 The large bright open plan room housed mannequins adorned with grand costumes from shows gone by and materials, sewing machines and bare garment stands, for those yet to be created. It’s clearly a place of inspired making. Delia (Head of Wardrobe) gave a real insight to the workings of the theatre’s wardrobe and many of the intricate and technical processes, which are undertaken to create the perfect costume for each character. The level of thought and attention to detail is unchanged, whether a show’s budget is small or plentiful. Before a stitch is sewn or a scrap of fabric dyed, the process begins with many searching conversations with designers to ensure that the garment created, is a true representation of their vision. Delia shared that a request for a ‘brown’ piece of clothing, will often be followed by questions about shade, texture and the production context; these are all important nuggets of information. The level of detail required is immense and fascinating. If a t-shirt is made to look dirty, Delia needs to know where the dirt hails from; a south Devon red field or an Irish peat bog, for example. The differing locations result in very different dye colours being used by those tasked with turning garment ideas into reality. 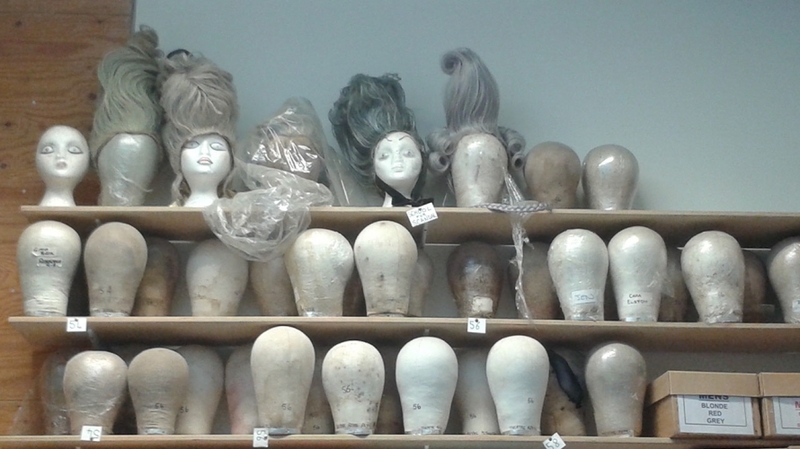 Characters that need costumes often need hair, so our tour took in the high stacked shelves decorated with both acrylic and real haired wigs, beards and moustaches. Vast arrays of colours, lengths and styles have been created, many of which are hand sewn, which I can only imagine is intricate and time consuming. The costume store was our next port of call, a kind of vast dressing up wardrobe. It’s home to endless rails of clothes and cubby holes of shoes from previous productions; all waiting to come to life in a new role. Costumes are re-used but also recreated. A bustle skirt in one show could return as a bag in another, or a plain dress may be adorned with ribbons and lace to create something more glamorous, if a show requires. The store is a great shared resource and has been utilized by schools, other theatres and local events. Some of the garments were recently used at the Port Elliott festival held in Cornwall. Many of the costumes used in productions are skillfully hand-made with fabric created using traditional and digital design methods. Stenciling, screen printing and adding costume jewellery, are some of the ways unique fabrics are created. Other clothing items are bought and fantastically reinvented. Delia’s specialism is creating special effects on fabrics and could involve anything from making a pristine white coat look weathered and paint splattered, to creating a blood or vomit stained t-shirt (a process that strangely involves using rabbit food). In the dye room we had a demonstration of the many ways that these effects are created, which includes using sprays, dying techniques and painting. I quickly realised that making a garment look authentically worn, dirty or stained, is a true skill. Delia shared that this process can take days as the dye is layered on the fabric and paint is sprayed, spotted and smudged in all the right places. A lot of trial and error is involved to create the right effect. It was a treat during our time to be able to try out a technique used to create fake embroidery on garments. With a piece of mesh fabric, acrylic paint and a small cardboard piping bag we all quietly set about trying to recreate a floral design. A steady hand and patience is a must. Whilst I didn’t produce a period drama masterpiece, I could clearly see how small details are not produced in a hurry. I have a sense that the imagination and patience of those working to produce costumes is vast; Delia told us in order to do this work ‘You have to love it’, and I think she does. I left with a real appreciation for the work that is put into the costumes we see on the stage. Designing, cutting, fitting, altering are all intricate and vital stages in the costume production process. Next time I see a show I’ll look more closely at the costumes that the actors are wearing in the knowledge that each piece has been on a journey before its stage debut.